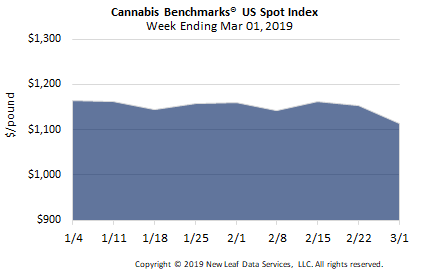 U.S. Cannabis Spot Index up 1.2% to $1,087 per pound. The simple average (non-volume weighted) price increased more than $5 to $1,117 per pound, with 68% of transactions (one standard deviation) in the $385 to $1,850 per pound range. The average reported deal size declined to 2.7 pounds. In grams, the Spot price was $2.40 and the simple average price was $2.46. The relative frequency of trades for greenhouse flower decreased week-over-week by 1%. The relative frequency of transactions involving outdoor product increased by the same proportion, while that for indoor flower was flat. Warehouse product’s share of the total reported weight moved nationwide increased by 2% compared to last week. The relative volumes of both greenhouse and outdoor flower each decreased week-over-week by 1%. The U.S. Spot Index reversed a sustained decline this week, ticking upward by 1.2% to settle at $1,087 per pound. The national composite rate rose on an increase in the volume-weighted price for indoor flower, as well as an expansion in that grow type’s relative volume. 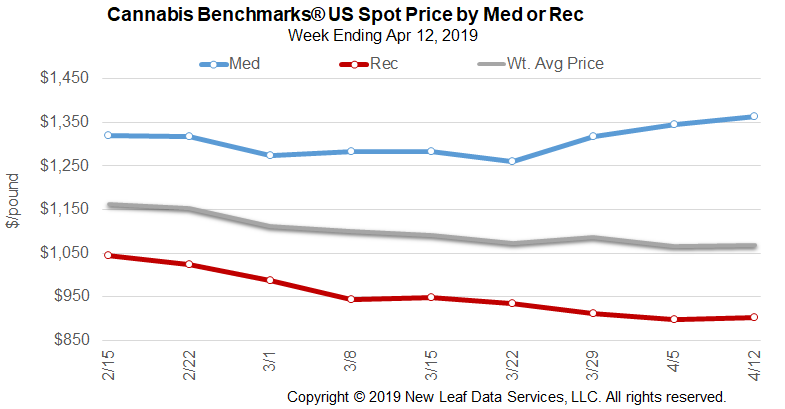 The U.S. rate for warehouse product is being pushed up by rising prices in the mid-sized medical markets of Illinois, Maine, Michigan, and New Mexico; of the four major Western markets only Washington saw prices for indoor flower increase this week. Expanding patient counts and demand in the first and final medical markets just listed have been driving prices in those states upward, while shifting regulatory landscapes in Michigan and Maine have resulted in uncertainty for participants in those markets. The histograms below show price dispersion by grow type for March 2019 versus March 2018. Most notably, nearly 80% of outdoor transactions were priced above $600 per pound last year, whereas nearly 85% are currently priced below $600. Additionally, expansion of greenhouse capacity in higher priced markets such as Nevada (compared to West Coast markets) helped increase the proportion of greenhouse transactions priced above $1,000 per pound from 34% to 43%. 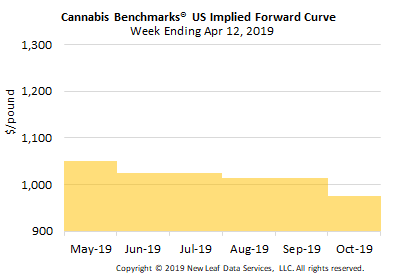 April 2019 Forward closes unchanged at $1,075 per pound. The average reported forward deal size declined to 46 pounds. The proportion of forward deals for outdoor, greenhouse, and indoor-grown flower was 59%, 28%, and 13% of forward arrangements, respectively. The average forward deal size for monthly delivery for outdoor, greenhouse, and indoor-grown flower was 44 pounds, 48 pounds, and 44 pounds, respectively. At $1,075 per pound, the April Forward represents a discount of 1.1% relative to the current U.S. Spot Price of $1,087 per pound. The premium or discount for each Forward price, relative to the U.S. Spot Index, is illustrated in the table below. 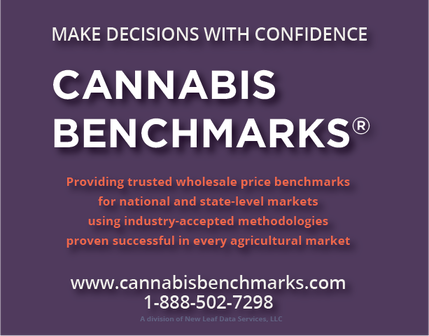 U.S. Cannabis Spot Index down 0.7% to $1,092 per pound. The simple average (non-volume weighted) price decreased $30 to $1,155 per pound, with 68% of transactions (one standard deviation) in the $415 to $1,894 per pound range. The average reported deal size declined to 2.8 pounds from 3.1 pounds last week. In grams, the Spot price was $2.41, and the simple average price was $2.55. The relative frequency of trades for indoor flower increased week-over-week by 1%. The relative frequency of transactions involving greenhouse product decreased by the same proportion, while that for deals for outdoor flower was unchanged. Outdoor product’s share of the total reported weight moved nationwide contracted by 1% compared to last week. The relative volume of greenhouse flower increased by the same magnitude, while that for indoor product was stable week-over-week. The U.S. Spot Index ticked downward for the fourth consecutive week, by 0.7%, to settle at $1,092 per pound. At this point, it appears unlikely that a late-March rally in the national composite price will occur, as it has in each of the previous two years. 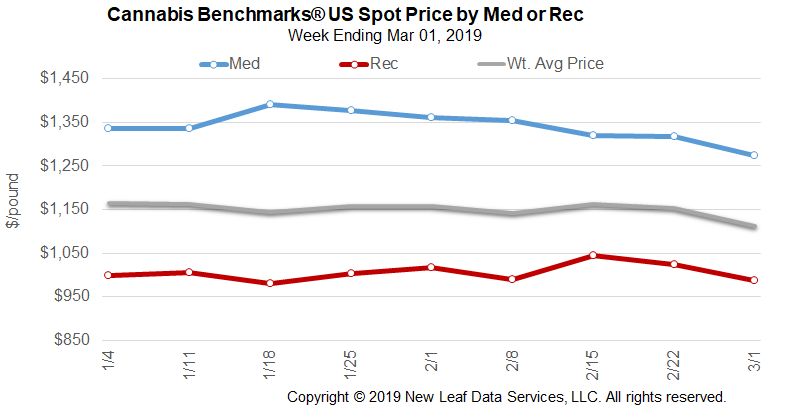 2017’s annual high price was observed in the final week of March, while the same week last year saw the second-highest weekly Spot rate documented in 2018. Still, it should be noted that sustained upward momentum in wholesale prices has been observed in several mid-sized and small markets so far this year – notably Michigan, Massachusetts, and Illinois. However, low and declining prices in the West Coast markets have overwhelmed those gains. 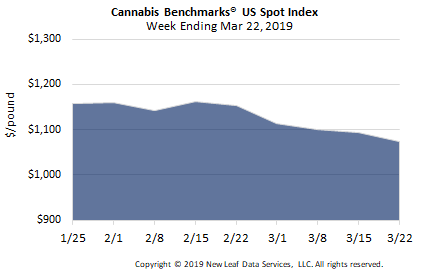 Colorado’s Spot Index also saw its second decline in three weeks, tempering the consistent ascent of prices that was observed earlier this year. The national volume-weighted price for flower to be sold in adult-use markets this week ticked upward slightly. 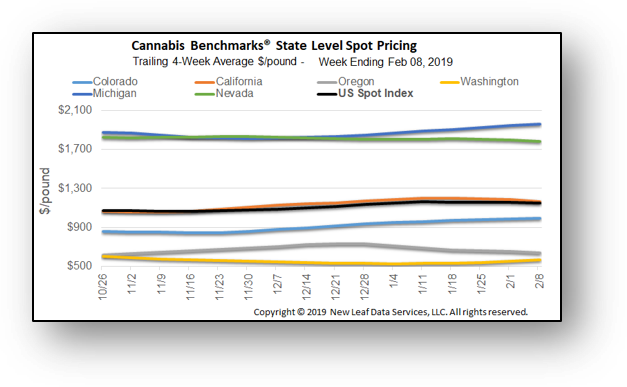 While Oregon was the only such market to see an increase in its Spot Index, an increase in reported trading volume from that state lent the price rise more influence, causing it to outweigh marginal decreases in the other major recreational markets. The average reported forward deal size declined nominally to 46 pounds. 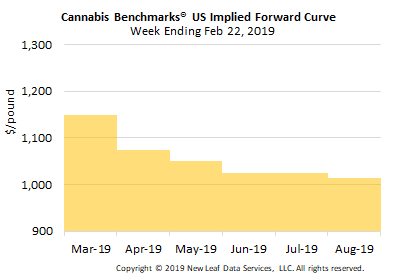 The proportion of forward deals for outdoor, greenhouse, and indoor-grown flower was unchanged at 56%, 28%, and 16% of forward arrangements, respectively. The average forward deal size for monthly delivery for outdoor, greenhouse, and indoor-grown flower was 50 pounds, 41 pounds, and 41 pounds, respectively. At $1,075 per pound, the April Forward represents a discount of 1.6% relative to the current U.S. Spot Price of $1,092 per pound. The premium or discount for each Forward price, relative to the U.S. Spot Index, is illustrated in the table below. 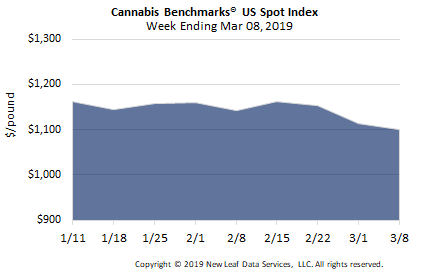 U.S. Cannabis Spot Index down 1.1% to $1,100 per pound. The simple average (non-volume weighted) price increased $16 to $1,185 per pound, with 68% of transactions (one standard deviation) in the $409 to $1,962 per pound range. The average reported deal size increased to 3.1 pounds. In grams, the Spot price was $2.42, and the simple average price was $2.61. The relative frequency of trades for indoor flower decreased week-over-week by 2%. The relative frequency of transactions involving greenhouse product decreased by the same proportion, while that for deals for outdoor flower was unchanged. Warehouse flower’s share of the total reported weight moved nationwide contracted by 1% compared to last week. The relative volume of greenhouse product increased by the same magnitude, while that for outdoor flower was stable week-over-week. The U.S. Spot Index ticked downward for the third consecutive week, by 1%, to settle at $1,100 per pound. Last year at this time, the national composite price had been on the rise for four straight weeks, behavior that would continue for another three consecutive weeks afterward. Falling prices in California, Oregon, and Nevada have been primarily responsible for the downturn in the U.S. Spot Index so far this year, outweighing gradual gains in the more mature licensed adult-use markets of Colorado and Washington State. With upward momentum in the latter appearing to level off in recent weeks, further downward pressure on the national average could come from the Evergreen State in the near future. 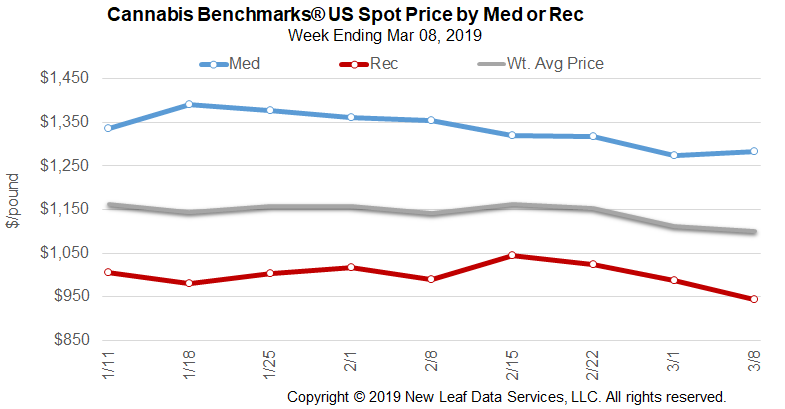 The national volume-weighted price for flower to be sold in adult-use markets this week continued the downward slide that commenced in late February on decreases in California, Washington State, Nevada, and Alaska. Upticks in the medical markets of Arizona, Michigan, Illinois, and Maine – as well as a few other smaller markets – drove up the national price for product designated for registered patients recorded this week. The average reported forward deal size was nominally unchanged at 47 pounds. The proportion of forward deals for outdoor, greenhouse, and indoor-grown flower was 56%, 28%, and 16% of forward arrangements, respectively. The average forward deal size for monthly delivery for outdoor, greenhouse, and indoor-grown flower was 51 pounds, 41 pounds, and 41 pounds, respectively. At $1,075 per pound, the April Forward represents a discount of 2.2% relative to the current U.S. Spot Price of $1,100 per pound. The premium or discount for each Forward price, relative to the U.S. Spot Index, is illustrated in the table below. 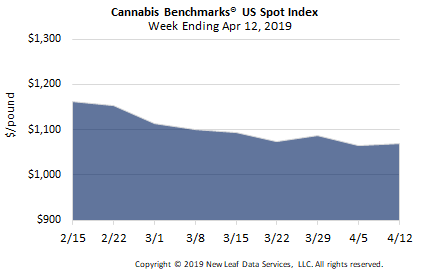 U.S. Cannabis Spot Index down 3.5% at $1,112 per pound. The simple average (non-volume weighted) price declined $53 to $1,170 per pound, with 68% of transactions (one standard deviation) in the $395 to $1,944 per pound range. The average reported deal size declined to 3.0 pounds. In grams, the Spot price was $2.45, and the simple average price was $2.58. The relative frequency of trades for indoor flower decreased week-over-week by 4%. The relative frequency of transactions involving greenhouse and outdoor product increased by 3% and 1%, respectively. 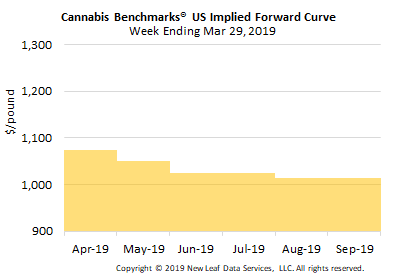 Warehouse flower’s share of the total reported weight moved nationwide contracted by almost 4% compared to last week, while the relative volumes of greenhouse and outdoor product grew by about 1% and 2%, respectively. 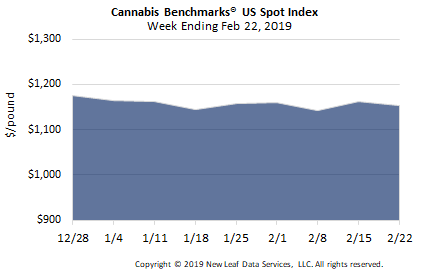 The U.S. Spot Index declined by 3.5% this week to settle at $1,112 per pound, a year-to-date low at this early point in 2019. Prior upward price movement in California, Colorado, and Washington State has been tempered and reversed in recent weeks. Decreases in the Spot Indices of those aforementioned markets this week joined the downward price pressure applied by generally falling rates in Oregon and Nevada thus far in 2019 to cause the U.S. Spot’s largest decrease documented to this point in the year. However, March is a month typically marked by strong sales in adult-use markets. 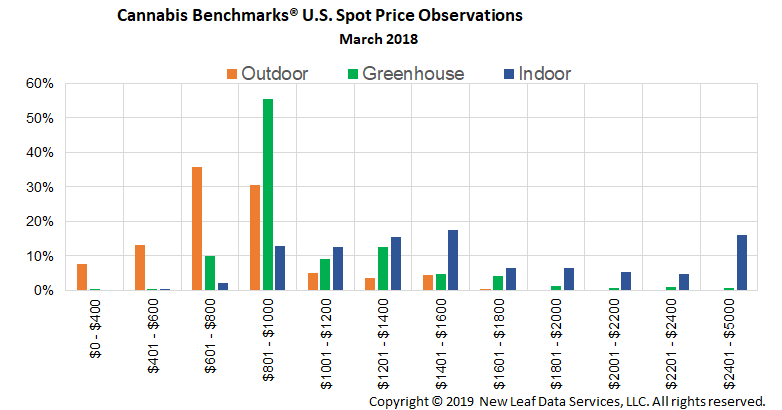 Last year, the U.S. Spot’s monthly average price increased by 5.2% from February to March 2018, from $1,279 to $1,345 per pound. Notably, though, the monthly composite rates of all four major Western markets, in addition to those of Nevada, Arizona, and Michigan, all experienced declines in the same span. 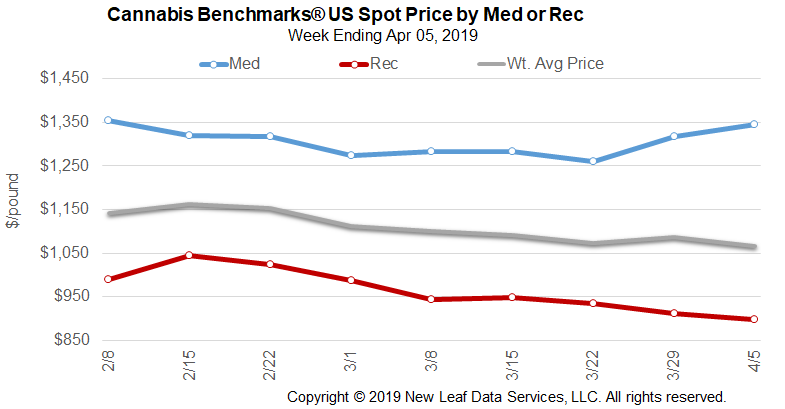 The national volume-weighted price for flower to be sold in adult-use markets slipped this week on decreases in all four major Western markets, as well as Nevada’s. Declines in the medical markets of California, Michigan, and New Mexico were primarily responsible for pulling down the national price for product designated for registered patients recorded this week. September 2019 Forward initially assessed at $1,015 per pound. The average reported forward deal size was nominally unchanged at 48 pounds. The proportion of forward deals for outdoor, greenhouse, and indoor-grown flower was 56%, 28%, and 16% of forward arrangements, respectively. The average forward deal size for monthly delivery for outdoor, greenhouse, and indoor-grown flower was 52 pounds, 42 pounds, and 43 pounds, respectively. At $1,075 per pound, the April Forward represents a discount of 3.4% relative to the current U.S. Spot Price of $1,112 per pound. The premium or discount for each Forward price, relative to the U.S. Spot Index, is illustrated in the table below. 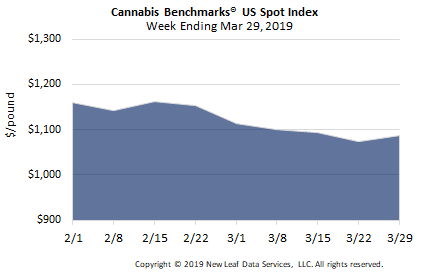 U.S. Cannabis Spot Index down 0.7% at $1,153 per pound. The simple average (non-volume weighted) price was nominally unchanged at $1,223 per pound, with 68% of transactions (one standard deviation) in the $414 to $2,031 per pound range. The average reported deal size declined to 3.1 pounds. In grams, the Spot price was $2.54, and the simple average price was $2.70. 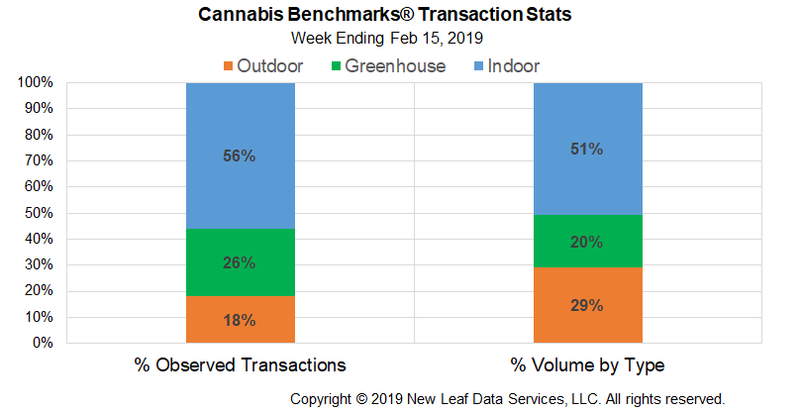 The relative frequency of trades for indoor flower increased week-over-week, by 2%, while transactions involving greenhouse product saw a decline in this metric of the same proportion. Warehouse flower’s share of the total reported weight moved nationwide shrank slightly this week, by about 1%, with the relative volumes of greenhouse and outdoor product both expanding modestly, by less than 1% each. The relative stability of national Transaction Stats in recent weeks belies their diversity in the major state markets, illustrated below. The U.S. Spot Index declined by 0.7% this week to settle at $1,153 per pound. The volume-weighted price for indoor flower, which had risen fairly steadily from mid-January, leveled off this week. On a state level, Colorado was the only one of the major Western markets to see an increase in its Spot rate, while Massachusetts was the only other state with a functioning adult-use market to see an increase in its overall going price, and a relatively small one at that. The national composite rate averaged $1,154 per pound for February, off nominally from January’s monthly mean of $1,157 per pound. In 2018, the U.S. Spot Index slipped by 4.8% from January to February, from $1,343 to $1,279 per pound. Of the major and secondary state markets, only prices in Oregon and Nevada are currently displaying behavior at least somewhat similar to observations from the first two months of 2018. 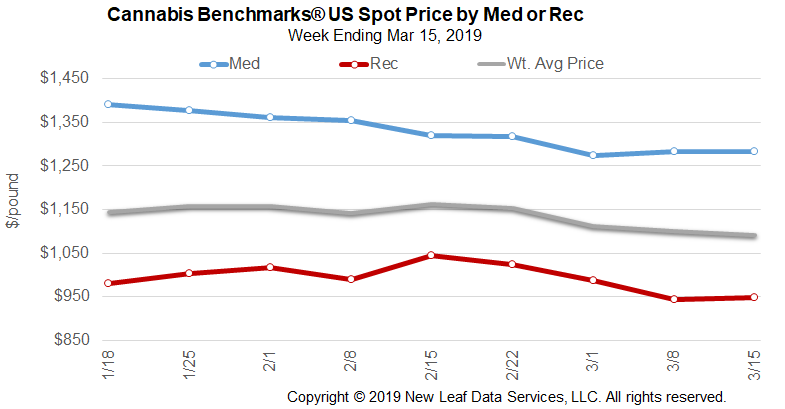 The national volume-weighted price for flower to be sold in adult-use markets slipped this week on decreases in California, Oregon, Washington, Nevada, and Alaska. Declines in the medical market of Arizona pulled down the national price for product designated for registered patients recorded this week, even as numerous other smaller medical systems saw upticks. March 2019 Forward assessed up $50 at $1,150 per pound. The average reported forward deal size decreased to 48 pounds. The proportion of forward deals for outdoor, greenhouse, and indoor-grown flower was 56%, 28%, and 16% of forward arrangements, respectively. The average forward deal size for monthly delivery for outdoor, greenhouse, and indoor-grown flower was 52 pounds, 44 pounds, and 43 pounds, respectively. At $1,150 per pound, the March Forward represents a discount of 0.3% relative to the current U.S. Spot Price of $1,153 per pound. The premium or discount for each Forward price, relative to the U.S. Spot Index, is illustrated in the table below. 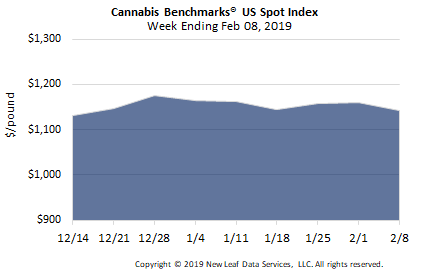 U.S. Cannabis Spot Index up 1.7% at $1,162 per pound. The simple average (non-volume weighted) price decreased by $25 to $1,223 per pound, with 68% of transactions (one standard deviation) in the $425 to $2,020 per pound range. The average reported deal size was nominally unchanged at 3.2 pounds. In grams, the Spot price was $2.56, and the simple average price was $2.70. The relative frequency of trades for both indoor and outdoor flower increased week-over-week, by 1% each, while transactions involving greenhouse product saw a 2% decline in this metric. 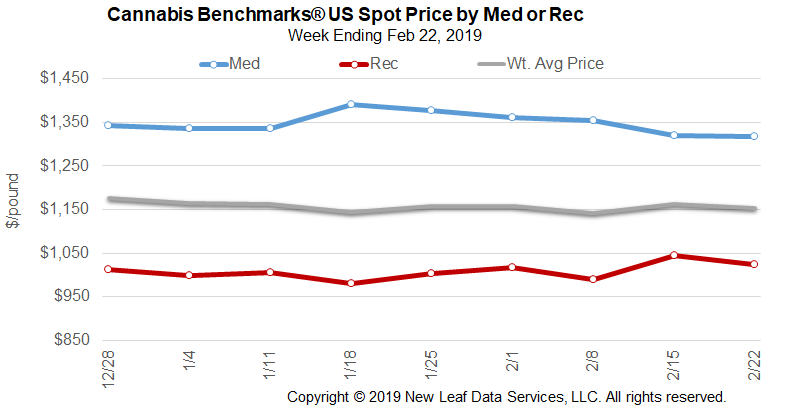 Warehouse flower’s share of the total reported weight moved nationwide grew slightly this week, by 1%, with the relative volume of greenhouse product contracting by the same proportion. Outdoor product is the only grow type to see its relative volume exceed its relative frequency of trades. The U.S. Spot Index increased by 1.7% this week to settle at $1,162 per pound. Oregon and Arizona were the only sizeable markets to see downturns in their composite prices this week, which were overwhelmed by increases in the Spot Indices of California, Colorado, Washington State, and Nevada. Smaller markets such as Massachusetts, Michigan, Illinois, and Maine have also applied consistent upward pressure on the national volume-weighted average this year. Based on historical sales data from more mature adult-use markets, January and February are typically months that see lulls in sales compared to the higher-demand months of December and March. 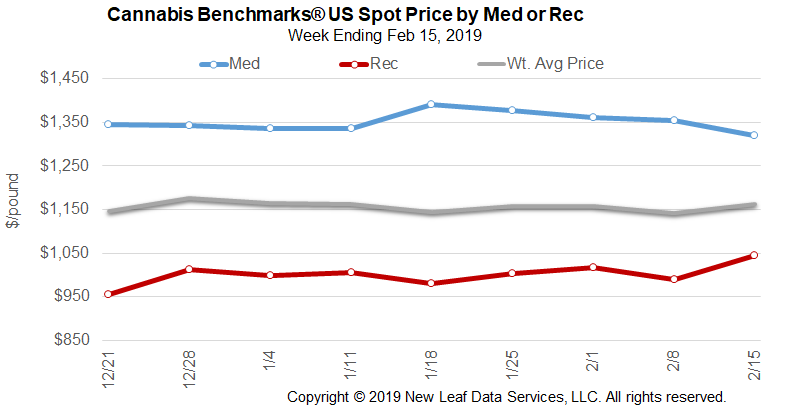 While the U.S. Spot Index did dip in the latter weeks of January and the early ones of February, this week’s price is virtually identical to the rate of $1,165 per pound, observed at the outset of the year. 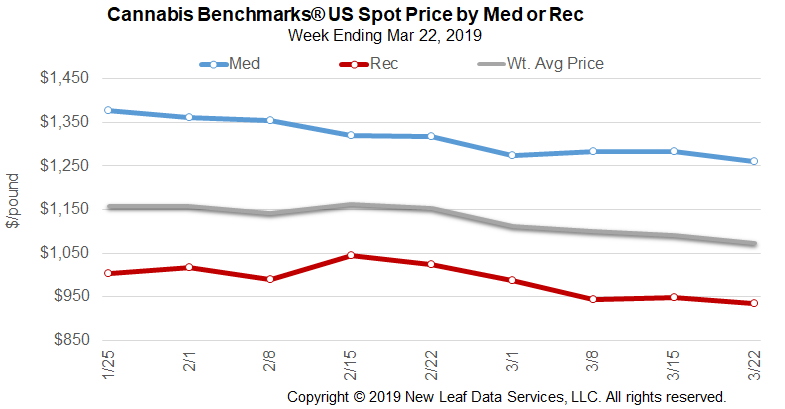 The national volume-weighted price for flower to be sold in adult-use markets jumped this week, primarily due to rises in California, Colorado, Washington, and Nevada. Declines in the medical markets of Arizona and New Mexico pulled down the national price for product designated for registered patients recorded this week, with assistance decreases in the smaller markets of New Hampshire and Vermont. March 2019 Forward unchanged at $1,100 per pound. The average reported forward deal size decreased to 49.3 pounds. The proportion of forward deals for outdoor, greenhouse, and indoor-grown flower was 55%, 28%, and 17% of forward arrangements, respectively. The average forward deal size for monthly delivery for outdoor, greenhouse, and indoor-grown flower was 53 pounds, 45 pounds, and 43 pounds, respectively. At $1,100 per pound, the March Forward represents a discount of 5.3% relative to the current U.S. Spot Price of $1,162 per pound. The premium or discount for each Forward price, relative to the U.S. Spot Index, is illustrated in the table below. How Many Licensed Cannabis Producers in Washington Are Really Operating? 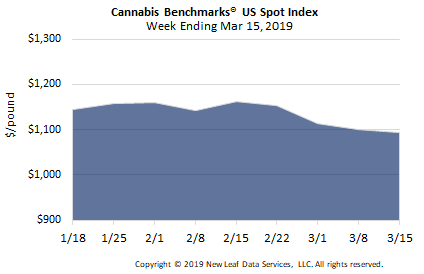 U.S. Cannabis Spot Index down 1.4% at $1,142 per pound. The simple average (non-volume weighted) price decreased by $8 to $1,248 per pound, with 68% of transactions (one standard deviation) in the $429 to $2,067 per pound range. The average reported deal size declined to 3.2 pounds this week from 3.3 pounds last week. In grams, the Spot price was $2.52, and the simple average price was $2.75. The relative frequency of trades for outdoor flower increased week-over-week, by almost 2%, while transactions involving indoor and greenhouse product each saw an almost 1% decline in this metric. 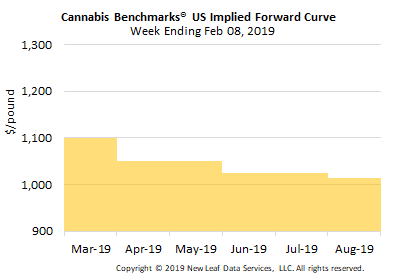 Similar movement was observed in regard to the relative volumes of the three grow types: That for outdoor flower expanded by 2% compared to last week, while warehouse and greenhouse product’s shares of the total reported weight moved each contracted by 1%. The U.S. Spot Index slipped by 1.4% this week to settle at $1,142 per pound. Although several mid-sized markets saw notable increases in their Spot Indices this week – including Massachusetts and Illinois – that upward price pressure was overwhelmed by declines in the composite rates of California, Colorado, and Oregon, with the West Coast markets just mentioned each seeing decreases of over $30 compared to last week. 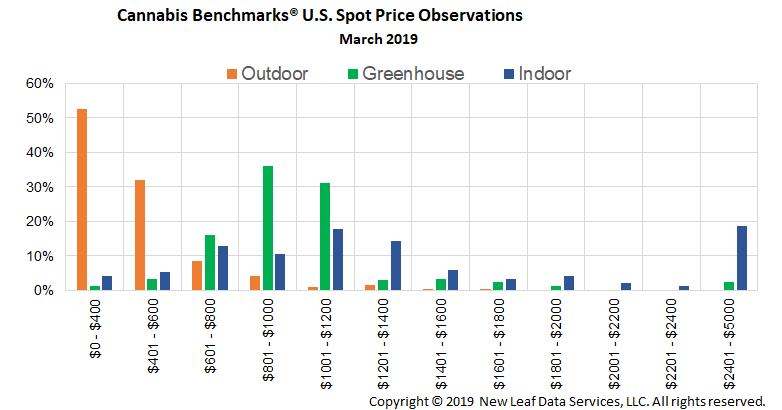 As of this week, the tug-of-war between the upward-trending national price for warehouse flower and the slowly-sliding U.S. averages for greenhouse and outdoor product saw the latter gain the upper hand. Elevated rates in California have for the time being buoyed the national price for indoor flower against sliding prices for such product in Colorado and Oregon this year. 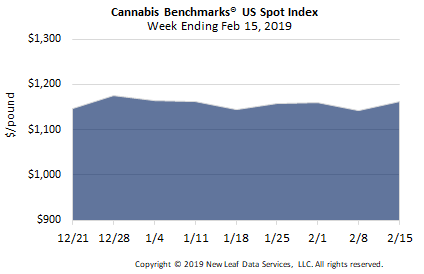 The Trailing 4-Week Average of the U.S. Spot Index persisted this week in the very gradual downward slide that has so far marked 2019, though its negative momentum accelerated somewhat this week. At the moment, the national average is being pulled down by declines in the trend lines of the Spot Indices of California and Oregon. Nevada’s Trailing 4-Week Average price also applying negative pressure, even as sales in the Silver State appear to be growing, at least as of late last year, as we discuss below. 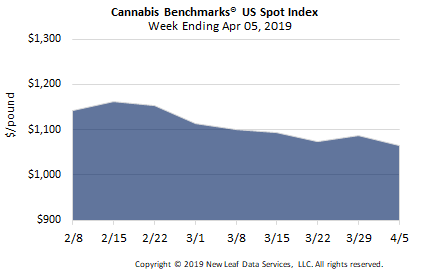 The trend line of Michigan’s Spot Index continued to rise this week, as more product recalls likely have buyers looking for inventory that they can be assured will not run afoul of regulators, despite being technically allowed to sell untested product. The average reported forward deal size decreased to 53.8 pounds. The proportion of forward deals for outdoor, greenhouse, and indoor-grown flower was 56%, 28%, and 15% of forward arrangements, respectively. The average forward deal size for monthly delivery for outdoor, greenhouse, and indoor-grown flower was 60 pounds, 48 pounds, and 43 pounds, respectively. At $1,100 per pound, the March Forward represents a discount of 3.7% relative to the current U.S. Spot Price of $1,142 per pound. The premium or discount for each Forward price, relative to the U.S. Spot Index, is illustrated in the table below.